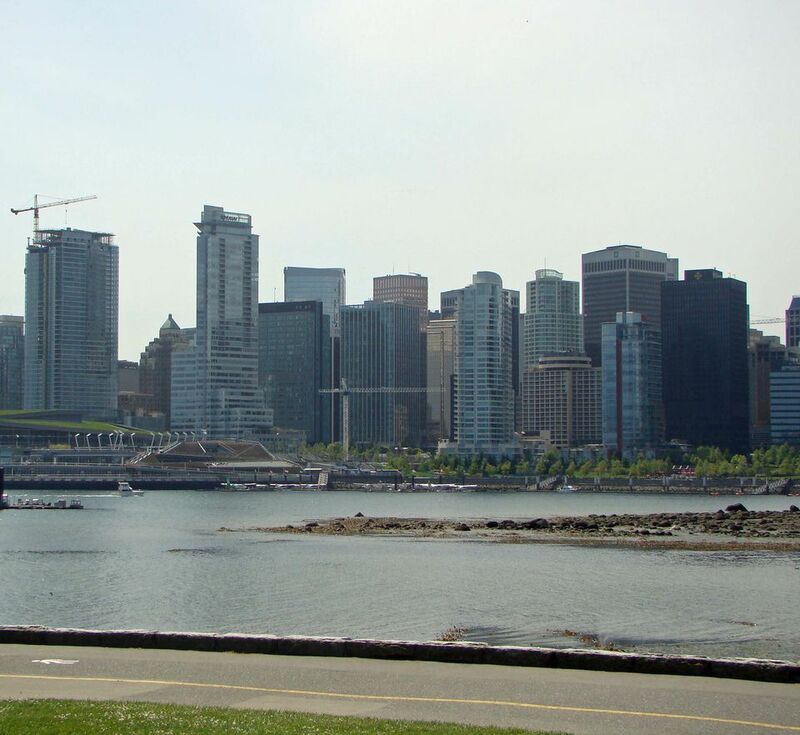 Vancouver offers a cosmopolitan experience framed by spectacular mountains and sparkling seas. It is among the most popular destinations on the Pacific coast, and in all of Canada. It is the embarkation/debarkation point for a lot of cruise trips, and its international airport provides connections to Asia and Europe. Vancouver can be expensive, so it pays to plan your stay carefully. Vancouver winters are the mildest in all of Canada, due to air currents coming off the ocean. It's possible to visit in the middle of winter and experience temperatures well above the freezing mark. The mild weather continues in summer, with high temperatures in excess of 80F (27C) relatively uncommon. You'll hear and read a lot about frequent rain in Vancouver, but it's only partially true. The chances of precipitation are greatest from November to March and smallest in summer. Do your baseline airfare searches for Vancouver, then check out sites of budget airlines such as WestJet, Canada's leading budget carrier. A taxi between the airport and downtown generally takes 30 minutes and runs about $25-35 CAD, with higher rates during peak traffic times. Many hotels offer airport shuttles at fees lower than taxi fare. Bus #424 is another budget option. It picks up and drops off at the ground floor of the domestic terminal. Sometimes it's cheaper to fly into Seattle (150 miles south) and rent a car. From Seattle, take Interstate 5 to Blaine, Washington. You'll be in the Vancouver suburbs once across the border. Be aware that the customs lines at the international border can be hours long during holidays and weekends. Vancouver does not have a lot of freeways spanning its downtown area. While that might be an aesthetic blessing, it also means trips into the most congested areas involve more stop lights and patience than you might expect. Airport trains make ground transportation cheaper here. If you'd rather not drive, the Sky Train covers much of the most important areas. You can ride the train and any other city buses you wish for a bargain rate of only $9 CAD/day. Taxis here are fairly inexpensive for such a large city. You'll pay $5-$10 CAD for most short downtown runs. There are plenty of mid-range hotels outside the city along the Sky Train route. Check to be certain the hotel is within walking distance of the station, or you'll eat up your savings in cab fare. Vancouver hotel rates are generally higher, but offer more convenience. Priceline and Hotwire are frequently useful for booking downtown hotels, some of which are within walking distance of the cruise port and other attractions. It's possible to get centrally located, four-star rooms for under $100 at certain off-peak times of year. If your budget is tight, search hostel options in Vancouver. Check recommendations for hostels and eight budget hotels. Airbnb.com offers more low-cost room options than might be expected in a coastal city. A recent search revealed more than 60 properties priced at less than $25/night. Cosmopolitan Vancouver offers a variety of dining options, with Asian specialties a big favorite. Another good choice is seafood. For a splurge, try the Boathouse Restaurant (corner of Denman and Beach, near English Bay) for a succulent salmon dinner and delicious sourdough bread. If your budget is more limited, there are plenty of low-cost meal choices in small eateries along Denman St. Tips: Fish and Chips are readily available. It's a tasty meal and usually not too expensive. If you opt for a sit-down meal, reservations are important here. British Columbia boasts many fine gardens. Here in Vancouver, Van Dusen Botanical Gardens offers 55 acres of beauty to its guests. Admission is about $9 CAD/adults and $20 for a family. If you're a history buff, you'll enjoy Gastown, is downtown Vancouver's oldest section and it has been carefully preserved. The name derives from gas street lamps, but the area offers galleries, restaurants, and nightlife in addition to architectural charm. One of the greatest attractions here is Stanley Park, among the world's best-loved urban preserves. Rent a bike or bring a picnic lunch and enjoy. Don't confuse the city and the island -- the latter is 450 km. (300 mi.) long and hugs the Pacific Coast. It's home to the provincial capital of Victoria and scores of postcard views. Quiet villages, mountains, and world-famous Butchart Gardens are all a part of the scene. Ferry fares average about $30 CAD one-way. Ships leave from mainland terminals at Horseshoe Bay and Tsawwassen for Nanaimo and Swartz Bay on the island. From the American side, ferries also depart Port Angeles, Wash. For best results, make the island an overnight stay if at all possible. Take a leisurely stroll through Granville Island: This attraction was once a grungy industrial park, but Granville Island has since been renovated and preserved as an artist colony and public market. Don't expect much activity prior to 10 a.m., but soon thereafter you should find everything you need for a great picnic lunch. Sample the artwork and other wares as your budget allows, but remember this is a great place to relax without spending a lot of money. If you're a shopper, check out Robson Street: Much of what you see along this fashionable thoroughfare might not fit into the budget category, but window shopping costs nothing, right? Robson Street is also home to budget-friendly stores and some great restaurants. Mountain views and skiing are nearby: World-famous Whistler ski resort area is just 125 km. (75 mi.) from Vancouver and makes a nice day trip from the city. It's not just a winter destination: kayaking, mountain biking, and golf are popular attractions in warmer weather. Closer to Vancouver, Grouse Mountain is a mere 15-minute drive from downtown and offers spectacular mountain and city views. Canada Place: A Waterfront Gem: This multi-million dollar complex will be the starting or ending point for Alaska cruise visitors in Vancouver. Canada Place is more than a port. Inside, you'll also find convention space, an IMAX theater, and hotel. This is the western terminus of the Sky Train, and convenient to Gastown attractions. Don't miss the sunset over English Bay: Go to the end of Denman St. and you'll find a public beach adjacent to Stanley Park. If skies are clear, there is likely to be a crowd watching street performers and sampling ice cream from nearby stores. Here you'll meet people from all over the world and from all walks of life. It's one of Vancouver's great attractions, and it won't cost you a thing!